Offshore wind farms typically use the largest available wind turbines on the market. Their size presents several issues, including understanding the characteristics of the boundary layer up to and above heights of 100m. Measurements offshore are costly, with costs driven to a large extent by the cost of constructing the support structure for the meteorological mast. These masts cost some EUR 1-5m, depending on site location and specification, which is perhaps 100 times that required for equivalent onshore work. Offshore monitoring towers are un-guyed, and therefore need to be wider, which can mean measurements are more susceptible to wind flow effects from the tower. Anemometry equipment is otherwise standard. 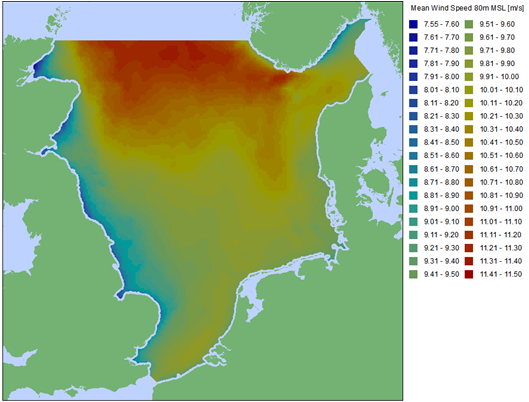 If high quality wind measurements are not available from the site or nearby, there are other sources of information that can be utilised to determine the approximate long-term wind regime at the wind farm location. There are offshore databases for wind data, including meteorological buoys, light vessels and observation platforms. Additionally, mesoscale modelling (based on global reanalysis datasets) and earth-observation data play a role in preliminary analysis and analysis of spatial variability. None of these are suitable for a robust financing report, however, they are producing increasingly accurate regional maps such as that for the North Sea in Figure I.5.1.